We leave early from Paralia Dionysiou. Michael runs to us to say goodbye soon because he has an appointment; he is surprised that we leave so early and his wife is also a little bit bewildered. And we ourselves actually also, we expected to have a cup of coffee or something, but they don't have time and at half past 9 we drive out of the village. But we will stop by on the way back, we have already decided. In one way or another, we have felt as at home here as we do in Scotland at Iain and Cathy, where we have been coming for 16 years now. First we drive some inner roads through the hilly north of Chalkidiki but after about an hour we are on the highway to the east. A mountain chain is accompanying us on the left, and somewhere behind it lies Bulgaria. To our right the land is becoming flatter and emptier. It is particularly striking that we see few forests, even hardly olive groves. Occasionally we see the sea but sometimes it is out of sight. In total we drive about 230 kilometers on this toll road (we paid € 4.80) until we arrive at Alexandroupoli, the last city before Turkey. We drive into the center and park our car at the first empty spot we see. I have no idea if you have to pay here but we have never seen parking attendants in Greece on the streets. Through the reasonably busy shopping streets we walk in the direction of the boulevard and there are many nice restaurants and cafes full of young people. 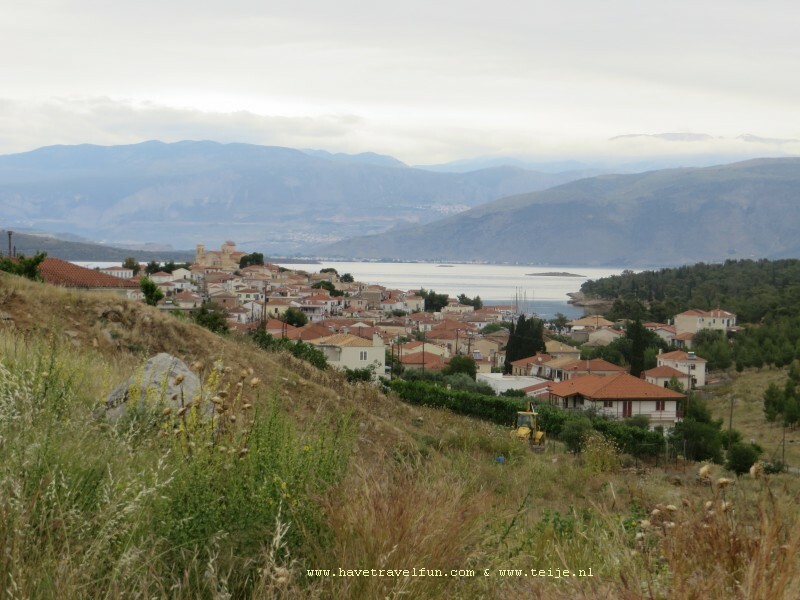 This town was only founded in 1880 but has since grown into the largest of Northeast Greece. The department (what we call provinces) here is called East Macedonia and Thrace. When we walk a little further towards the sea, everything looks a lot more deserted, a port that is not really alive, a train station that looks rather shabby. Even the amusement park looks dead. This area was added to Greece only after the 1st World War, before it was part of Bulgaria and the Ottoman Empire. At the beginning of the 19th century there was a small fishing village here that slowly grew into a city. 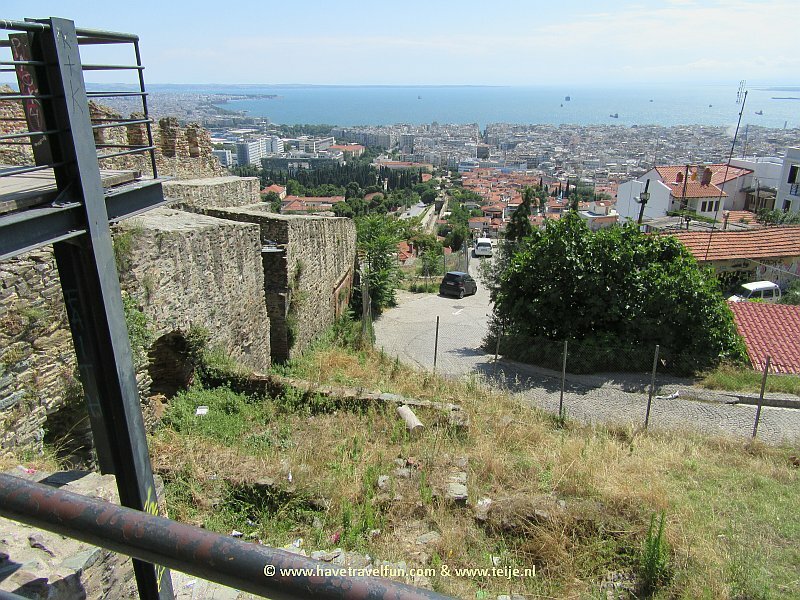 After becoming part of Greece, King Alexander I came to visit in 1920, after which the city was called Alexandroupolis. In classical antiquity there was already a Greek city, called Sale of Sali, but the remains of it are under current city. In the center stands the lighthouse at the harbor and a statue for 2 heroes of the struggle for independence against the Turks that began in 1821 and which ultimately led to the independence of Greece, the first time that it became a real country. Even in classical times, Greece has never been more than a coherence of city-states that formed alliances with each other but also competed against each other. This statue shows Domna Visvizi and her husband who put all their possessions in the fight against the Turks. After his death, she became captain of a warship and Greeks still look up to their heroes from that war, which is more important in their history than the 1st or 2nd World War. After all, it was the beginning of their own fatherland or motherland. We take a long walk through the city and there is a big difference between the lively center and the surrounding neighborhoods, which are mostly for housing and are a lot quieter. The streets are laid out broadly and you can see that it is a reasonably modern city with few remains from earlier times. We visit the Sint Nicholas church and two schools stand next to it, the center of religion and education, and then we walk back to the car. It is a bit of a search, but when we get back to the classical building of the ethnological museum, we know where we need to be. After this we continue to the Evros delta, a swampy area of the Evros on the border with Turkey. Along the sand trails we see numerous bird species including many herons and birds of prey. The area seems to be a mecca for bird spotters. In the meantime, we try to find a way to the coast on the sand tracks but that does not work out very well. And we are most surprised by the police car we encounter here and the question from the officers where we come from. You hardly ever see them on the usual roads and then we suddenly encounter them on a sandy path! Probably to avoid any villains. We have bridged the distance to this corner in the east of Greece faster than we thought and when we get close to the hotel, we first have a look around. Of course we see more churches, although the one at Loutra Traianoupoleos looks different from others. We are not so well informed about all architectural trends as far as churches are concerned, but the variation in churches is very large here although there are always the turrets, often the same red roofs above it and usually a separate bell tower. We arrive quite early at our new hotel, Isidora, in Loutros. We have to wake up the owner to get in and it takes a while before she arrives at the reception. And if she gives us the key to the room and I want to put it in my pocket, I find out that I still have the keys from the previous apartment. In the rush in which we left, we have completely forgotten the keys. We call directly with Michael, who has already sent an email with the question about the key, and we promise that we will come back soon. Fortunately they still have a spare key (they always have at least one). After we have put our stuff in the room, we walk around the ground. According to the signs there are thermal baths next to the hotel but we only see a drain with hot water a little further away. However, there is an old Byzantine church and some domes that used to be the Ottoman bathhouses but ruins now. And furthermore there are a lot of mosquitoes here, we had hardly had any problems with that up to now (just cats and dogs in Paralia Dionisiou who were particularly active at night). The managers of the hotel speak almost no English but with some gestures they make it clear that they would like to make a meal for us. We do not understand the Greek menu so we just order something and will see what it is. Eventually we get some grilled meat with a salad and it tastes good and is not expensive at all. It is a pity that we can not really communicate with them.